Today I had the good fortune of meeting Rich Wieske and Joan Mandell (on the right). They were honored guests at this year’s annual Northeastern Kansas Beekeepers Association “Funday” event in Lawrence Kansas. 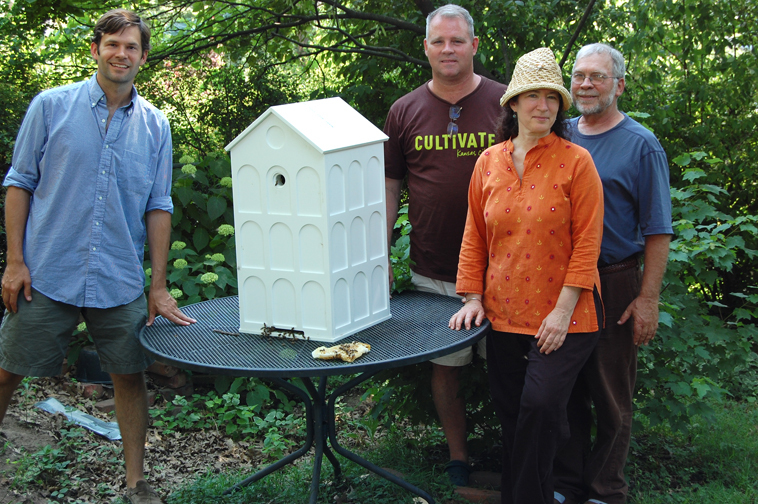 Rich and Joan are partners in Green Toe Gardens, which is a community-based apiary in Michigan. Today they keep around 100 hives in Detroit and its northern suburbs. Joan is an award-winning documentary filmmaker and journalist and is currently producing the film “Wild Detroit Honey.” Local beekeeping legend and good friend Robert Burns (center) showed them around Kansas City and brought them by to see my recently finished hive sculpture. I loved hearing about some of the great grassroots community work they are doing back in Detroit, including keeping an apiary of almost every different style of beehive I have heard of in a special high school’s urban farm.